We speak to Kate, our client of the month, to gain some insight into her incredible body transformation. We are so proud of how far she has come on her journey, and how she made the shift to a healthier and happier version of herself. “I have been struggling with stored fat on my inner-thighs, outer-thighs and knees since teenagehood. After having two kids, I had stored additional body fat on my stomach and love handles” she says. A few reasons for this include muscle loss, being less active and the natural ageing of the metabolic processes within the body. Kate knew that she needed a change as she didn’t feel comfortable in her own body. With a demanding job and a family at home, Kate wanted a solution that would maximise her time and effort. Kate recalls, “I first thought of undergoing surgical liposuction to get rid of the excess unwanted fat stored in different areas of my body, but after talking to a friend at a dinner party, she said I should look into non-invasive Cryolipolysis fat freezing instead”. After talking to a friend about going under the knife, Kate was told to look at other non-surgical alternatives such as Coolsculpting, which could help her attain the same results without having to go under the knife. She went ahead and did some research as it sounded much better than undergoing surgical liposuction. 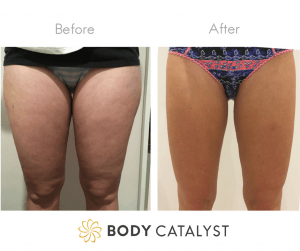 Kate came to Body Catalyst for a complimentary consultation in search of a holistic solution to help guide her journey towards self-love and body confidence. During her consultation, Kates’ lifestyle and background were discussed, along with her body goals and the ideal technology application to achieve optimum results for her body type. also moving my body more to assist with the process”, she explains. “I had multiple non-invasive fat freezing combined with skin tightening treatments around my stomach and legs. I treated stubborn bulges of fat that were stored in my body for years in areas where I thought I would never be able to. As time went by, I have noticed that my stomach has flattened and my thighs strengthened. I have also lost fat in my legs and around my knees where skin used to sag”. “What I like most about these treatments is the fact that It is so convenient and easy, as each session is performed under an hour with no downtime, which means that I can go back to work or pick up the kids from school straight after leaving the clinic”. Now, Kate has built her dream physique by reshaping it, lost fat in stubborn targeted areas, two dress sizes and has made the shift towards a healthy lifestyle. The guidance given by our nutritionists has helped maintain the results she has obtained with fat freezing without dieting. Kate enjoys food and does not follow a particular diet regime, but rather focuses her efforts on eating wholefoods daily. She has also started exercising to maintain these results, going to the gym and practicing yoga and pilates. “I am now on a maintenance plan with Body Catalyst and would only go occasionally to ensure I stay on track. RF skin tightening is perfect for this phase as it stimulates the production of collagen and elastin, leaving my skin looking smoother”, Kate shares. With these physical improvements and a maintained healthy diet, Kate has achieved an incredible transformation inside and out. 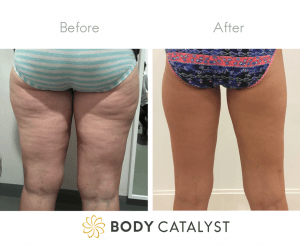 For more information on fat loss or overall wellness please contact one of our qualified Body Catalyst therapists to book your free consultation.